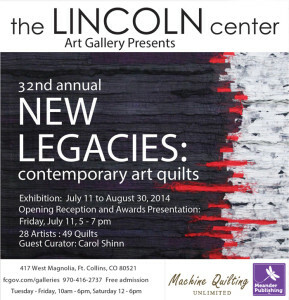 I am honored to be a part of this exhibition, curated by Carol Shinn, who does wonderful thread paintings. I will be at the International Folk Art Festival in Santa Fe this weekend, and will miss the opening at the Lincoln Center Art Gallery in Fort Collins, CO. Don’t you hate it when you can be in two places at once? 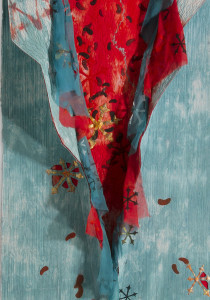 My piece, Off the Wall II, will be a part of the exhibition through August, so check it out if you are in Colorado. It will be the first time it is seen publicly outside of Tucson. Thanks, Dad. It is 8 feet tall, so this is only a small portion of it. i like this off the wall. unique!